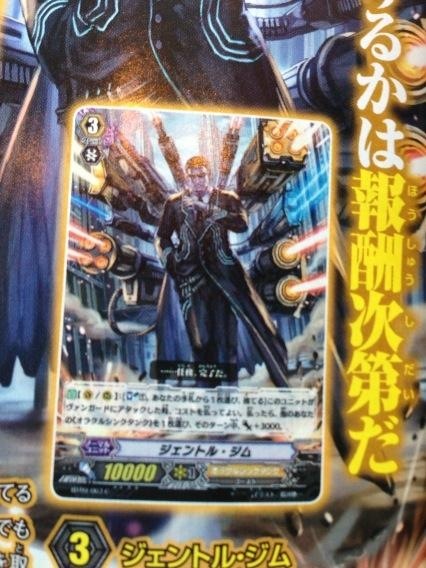 [ACT](VC): Limit Break 5 (This ability is active if you have five or more damage):[Counter Blast (3)] Until end of turn, this unit gets [Power]+5000/[Critical]+1, gets « [CONT](VC):This unit battles every unit in your opponent’s front row in one attack. 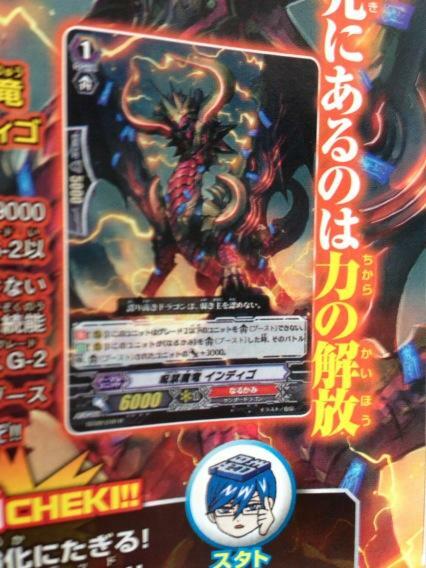 [CONT](VC): If you have a card named « Dragonic Kaiser Vermillion » in your soul, this unit gets [Power]+2000. By ingesting the « Blood of the Dragon Emperor », Dragonic Kaiser Vermilion forcibly awakened the power sleeping inside him. Boasting tremendous power, the blood of the first emperor of the Dragon Empire is said to kill the weak who try to ingest it, but the strong become even stronger … … … But the cost for gaining such incredible, if temporary, power is that this forbidden treasure quickly burns out the life-force of whoever consumes it. Not hesitating one bit, he drank up the fetish that everyone feared but called a treasure. Reasoning he wasn’t worthy of it if he was afraid of pitiful little things like « Death ». The only thing he fears is the defeat of the empire. He seeks to defeat the Ancient Water Dragon and the Lion of Light, as a way to clear a path to destroy the unseen invaders, all while the Dragon Emperor eats up his life-force. A member of « Battle Sisters », a fighting religious order consisting of Sanctuary-born agents. She’s a crackshot sniper who uses a gigantic super photon rifle. Constantly boasting « My target never gets away », among the top classed members, she’s the only one proficient in sniping. But, she’s a showy girl who gets carried away and loves flattery and praise, so in otherwords, her friends say she’s really friendly, but this also lets her keep control and do her job in ways that best benefit the team. She fires holy bullets at those who have commited sins and crimes. She gives the sinner a single warning shot, so they can reform themselves and save their souls, but they ignore her warning, she’s sure to give them a visit. An Agency that belongs to the fighting religious order « Sanctuary Guardians », they handle elimination and arrests as the Crime and Vice Division of Oracle Think Tank . They insist on dressing like nuns since they are members of the Church. All their members are experts in magic and combat techniques, though it’s not sure because they are involved in many situations that are kept out of the public eye, or because they consist of many strong woman with quirky and rather bizarre personalities. 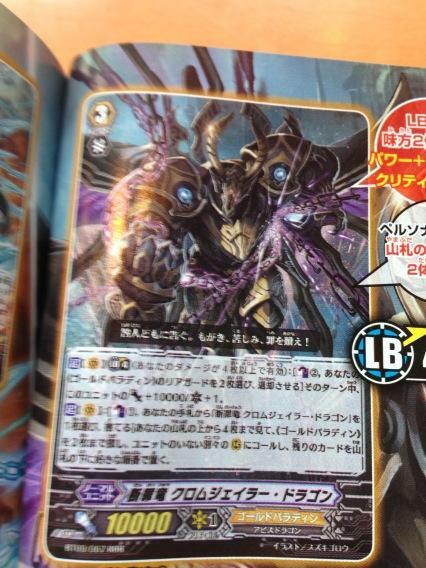 [AUTO](VC):[Choose a «Gold Paladin» from your hand, and discard it] When this unit attacks, you may pay the cost. If you do, this unit gets [Power]+6000 until end of that battle. 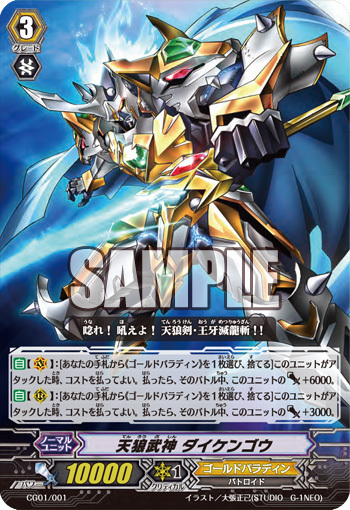 [AUTO](RC):[Choose a «Gold Paladin» from your hand, and discard it] When this unit attacks, you may pay the cost. If you do, this unit gets [Power]+3000 until end of that battle. A super ancient mobile weapon which was discovered in the ruins where the Silver Wolf Armor was resting. It’s a living mechanical entity with a will of its own, and capable of operating on its own, but its real power requires someone riding inside of it. Thousands of years ago, when United Sanctuary was threatened by Dragon Empire, it suddenly appeared on the battlefield, and aided the out-numbered Royal Paladins. After that, he followed and fought side by side with the first Silver Wolf warrior, as they journeyed the world, but when his master died, he fell asleep deep inside the earth, along with the armor. But now, his new master, the Great Silver Wolf, Garmore, was caught in a crisis. The god of war who once swung his sword to keep the peace of United Sanctuary, once again bares his fangs. Hi everyone ! 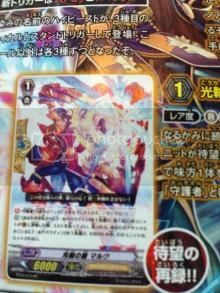 Earlier, in the past week, we were talking about the new BT09 cards, and the famous Secret Murakumo that was going to get released in the same set, but with an unknown effect. Here it is ! Bonjour à tous ! 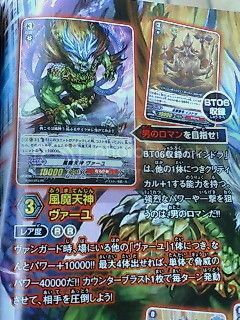 Plus tôt, dans la semaine passée, nous parlions des nouvelles cartes BT09, dont la fameuse Unit Murakumo classée Secret qui allait sortir dans la même extension mais dont l’effet était inconnu. Le voici ! Auto: [VC] Limit Break 4 (This ability is active if you have four or more damage):[Counterblast 1, Choose a card named « Phantasmagoric Snowy Wind, Shirayuki » from your hand and discard it] At the beginning of the guard step in which this unit gets attacked, you may pay the cost. If you do, select up to one attacking unit, and that unit gains -20000 Power during this battle. A member of « Battle Sisters », a fighting religious order consisting of Sanctuary-born agents. Usually, this girl is the very picture of absolute seriousness, but when driven to doing something with all her heart and soul, she tends to do the most ridiculous things to get it done. Based on this « Straight Man » (Tsukkomi) personality and her choice of a paper fan, typically used as a slapstick prop, as her deadly weapon, it would appear she grew up on the traditional comedy routines of her birthplace. As well, other members of group hoped she would add comical designs to her habit, but she doesn’t really want to. Technically, her personal weapon is an iron cane, but because there’s a lot of reasons for her to have her paper fan on hand, she often ends up carrying the fan with her, by mistake, to her missions. Note: Chai is basically acts like a Kansai/Osaka bumpkin Tsukkomi cliche in personality. To translate that to Cray, she’d be a pretty straight, no nonsense girl from the rural parts of United Sanctuary. Kansai-ben (how Chai is talking) is best expressed as having a ‘Joysey’ or Southern accent in English. [AUTO](VC):[Choose a «Narukami» from your hand, and discard it] When this unit attacks, you may pay the cost. If you do, this unit gets [Power]+6000 until end of that battle. [AUTO](RC):[Choose a «Narukami» from your hand, and discard it] When this unit attacks, you may pay the cost. If you do, this unit gets [Power]+3000 until end of that battle. Hey people ! Yesterday you had some cards leaked from the monthly magazine, here is the remaining part… You better be ready ! The BT09 page has been updated ! Salut tout le monde ! Hier vous aviez eu droit à un aperçu du fameux magazine mensuel, voici la partie restante… Préparez-vous ! La page BT09 a été mise à jour ! 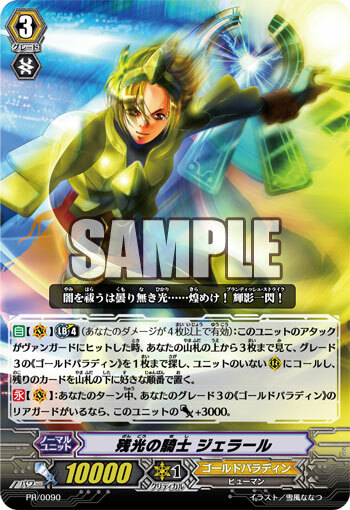 Auto: [Counter Blast 1] When this Unit appears in the Rearguard Circle from the Deck, you can pay if the cost. If you do, you can select 1 Grade 2 or higher Opponent Unit in the Front Row, retire it. Auto (R): At the end of a Battle in which this Unit was attacked, retire this Unit. Continuous: This Unit is treated as a « Gold Paladin ». 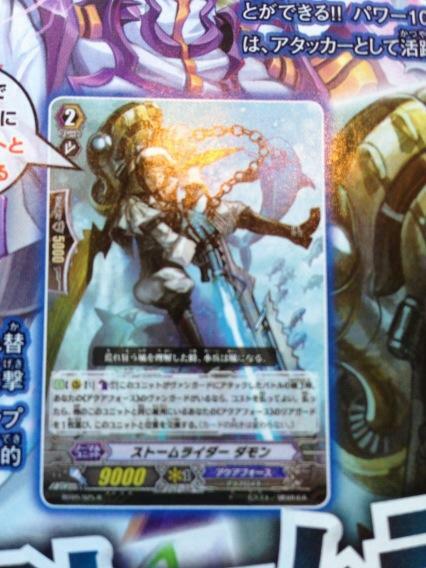 Auto: [Counter Blast 1] When this Unit appears in the Rearguard Circle from the Deck, you can pay if the cost. If you do, you can select 1 Grade 2 or lower Opponent Unit in the Front Row, retire it. Auto (R): [Counter Blast 1, Place this Unit in the Soul] Look at up to the top 10 cards of your Deck to select a <>, place it in the Soul, then shuffle the Deck. (R): [Soul Blast 1] When this Unit Boosts « Nightmare Summoner Rakiru », you can pay the cost. If you do, the boosted Unit gains 5000 Power. 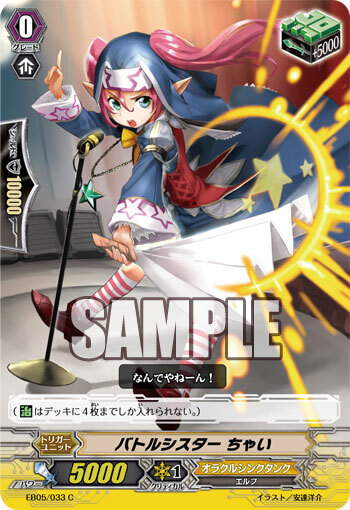 Auto (R): When this Unit Boosts a Vanguard that Drive Checks a Grade 3 « Pale Moon »: During this turn, this Unit gains the following effect: « Auto (R): [Place this Unit in the Soul] At the end of the Battle in which this Unit boosts, you can pay the cost. If you do, select 1 <> in your Soul, except « Fire Juggler », and call it to a Rearguard Circle. Auto (V) Limit Break 4 (This ability is active if you have four or more damage): When this Unit attacks the Vanguard, this Unit gains 5000 Power during this Battle. Auto: [Counter Blast 2] When this Unit appears in the Vanguard Circle, you can pay the cost. If you do, select 1 <> in your Soul, call it to a Rearguard Circle. Auto (R): [Counter Blast 1]: At the end of a Battle in which this Unit attacked the Vanguard, if you have an <> Vanguard, you can pay the cost. If you do, you can select one of your <> Rearguard in the same Column, and the two card’s places switch. (The card’s positions (Stand/Rest) do not change). 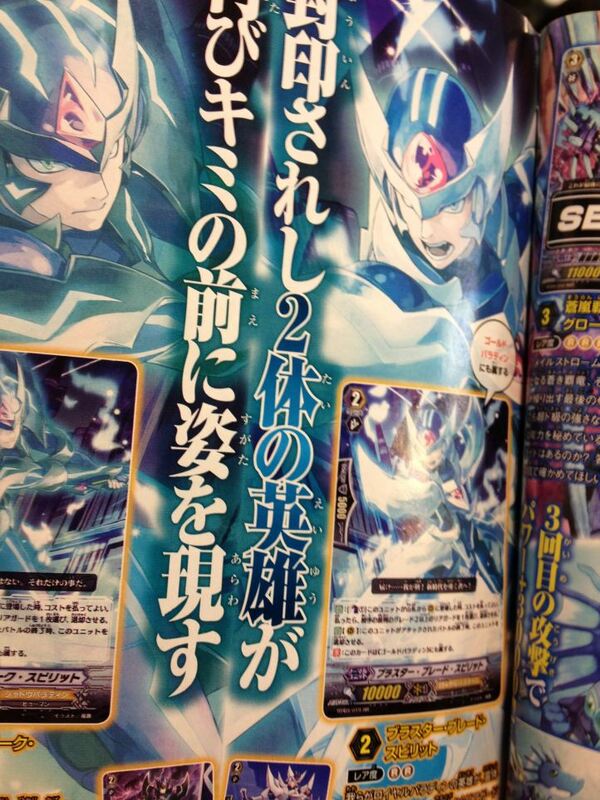 Auto [V] Limit Break 4 (This ability is active if you have four or more damage): When this unit attacks the Vanguard, and it’s the 3rd attack or more, unflip 2 damages on your Damage Zone. 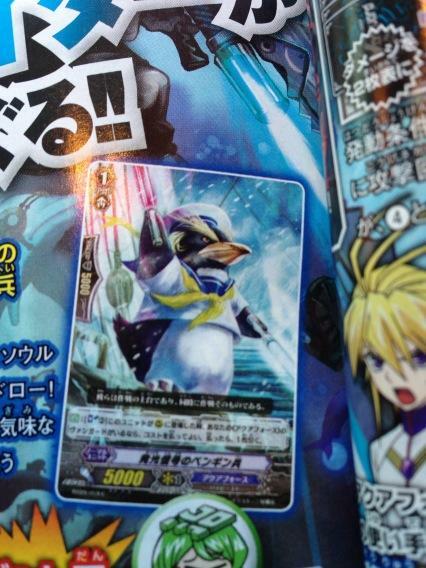 Activate [V]: [Counterblast (2)] Choose one of your <> Rearguards, it gains +3000 for the turn. AUTO[R]: [Counter Blast (1) & Place this unit into your soul] During the battle when this unit boosted a , if the attack hits a vanguard, you may pay the cost. If you do, choose one of your rear-guards and [Stand] it. 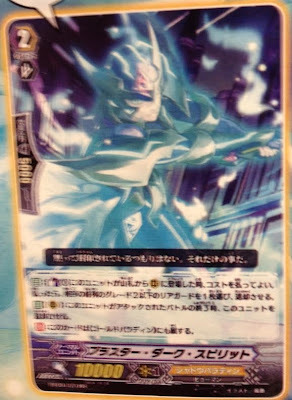 Activate (V) Limit Break 4 (This ability is active if you have four or more damage): [Counter Blast 1, 「Melodist of the Starry Sky, Farrah」 in your hand, discard it] Soul Charge 2 Cards, then select 1 <> in your Soul, call to Rearguard Circle, and during this turn, this Unit gains 3000 Power. ACT 【R】: [Counter Blast (1) & Choose two of your «Oracle Think Tank» rear-guards, and retire them.] Search your deck for up to one card named « Goddess of the Sun, Amaterasu », reveal it to your opponent, put it into your hand, and shuffle your deck. Auto (V/R): [Soul Blast 1 ; Select 1 Card in your hand, discard it] When this Unit attacks the Vanguard, you can pay the cost. If you do, Select another of your <>, it gains 3000 Power during this turn. 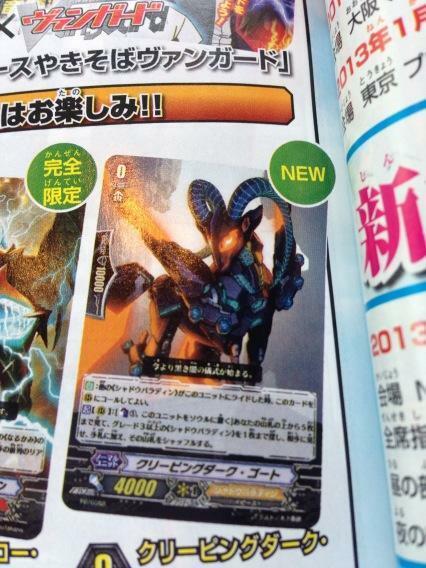 Auto: [Counter Blast 1] When this Unit appears in the Guardian Circle, if you have a <> Vanguard, you can pay the cost. If you do, this Unit gains 5000 Shield. Activate (V) Limit Break 4 (This ability is active if you have four or more damage): [Counter Blast 2, Select 2 of your <> Rearguards, retire them] During this turn, this Unit gains 10000 Power and 1 Critical. 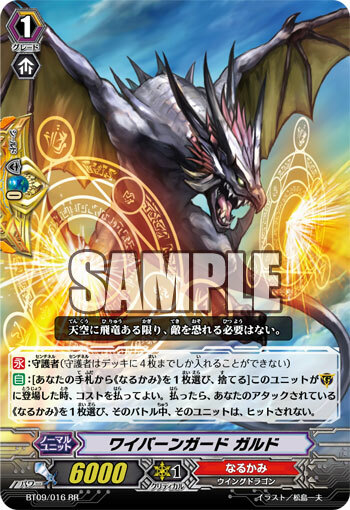 Activate (V): [Counter Blast 1 ; 「Convicting Dragon, Chrome Jailer Dragon」 in your hand, discard it] Look at up to the top 4 cards of your Deck, select up to 2 <>, call them to seperate Rearguard Circles, then place the remaining cards at the bottom of your Deck in any order. Auto (R): When this Unit Attacks, if you have a « Vermillion » named Vanguard, this Unit gains 3000 Power during this Battle. Continuous (V/R): This Unit cannot Boost a Rearguard. Auto: When this Unit appears in the Vanguard or Rearguard Circle, select 1 <> Vanguard or Rearguard, select 1 of its Continuous Abilities, during this turn, that Unit loses that Ability. Auto 【V】：[Counter Blast (1)] When this unit attacks、you may pay the cost. If you do, during this battle、for each 「Evil Heavenly God of Wind, Vayu」 on your Rearguard Circle、this unit gets Power +10000. 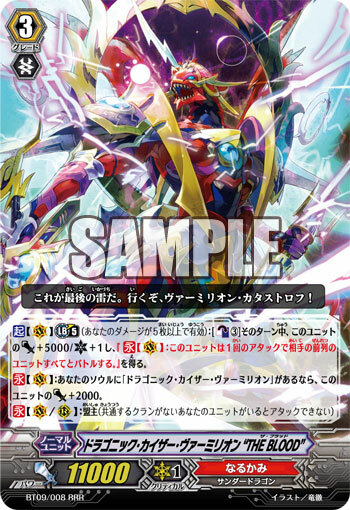 Auto 【V】Limit Break 4 (This ability is active if you have four or more damage): [Counter Blast (2)] When this unit attacks a Vanguard, you may pay the cost. If you do, during this battle, select 1 of your other <> Rearguard, Stand it, during this turn, that unit gets +Power +4000, at the end of this turn, retire the selected unit. Auto 【V】 ： When this unit attacks a Vanguard, during this battle, Power +3000. Halo Shield, Mark reprinted as a RR with Sentinel Restriction. Cont (R): This Unit cannot Boost a Grade 2 or lower Unit. Activate (R): When this Unit Boosts, during this Battle, the Boosted Unit gains 3000 Power. Auto (R): When this Unit Attacks, if you have a « Amaterasu » named Vanguard, this Unit gains 3000 Power during that Battle. Auto (V) Limit Break 4 (This ability is active if you have four or more damage): When this Unit attacks a Vanguard, it gains 5000 Power during this Battle. Activate (V): [Counter Blast 1] Select a 1 Grade 2 or higher <> Rearguard, look through your Deck for a Unit with the same name, call it to a Rearguard, Shuffle your Deck, and when this Turn ends, place the Called Unit to the bottom of your Deck. Activate (R): [Place this Unit in your Soul] Select 1 of your <> Units(? ), it gains 3000 Power during this turn. Auto: [Counter Blast ?] When this Unit appears in the Vanguard/Rearguard Circle, if you have a <> Vanguard, you can pay the cost. Select 1 of your <> Rearguards, except « Stealth Fae, Oborocart », look though your Deck for up to 1 Unit with the same name as the target, call it to the Rearguard Circle, then shuffle your Deck, and at the end of your turn, place the Called Unit to the bottom of your Deck. Auto: [Counter Blast 2] When this Unit appears in the Vanguard or Rearguard Circle, if you have a <> Vanguard, you can pay the cost. If you do, select of your opponent’s front row Rearguards and retire it. Hi, here is some leak from the KeroKero Ace of this month… And brace yourselves ! Bonsoir ! Voici quelques infos tirées du KeroKero Ace de ce mois-ci… Et préparez-vous ! « This is the final thunder. Let’s go, Vermillion Catastrophe! 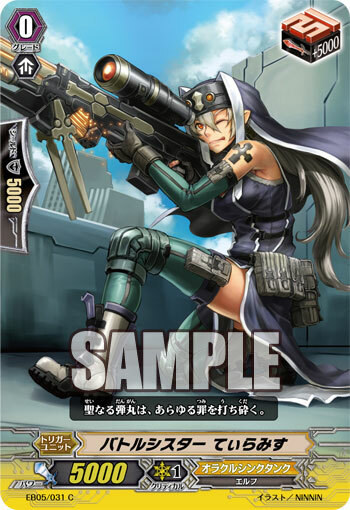 [AUTO]: [Counter Blast 1] When this unit is placed on Rear-guard Circle from your deck, you may pay the cost. If you do, choose an opponent’s grade 2 or higher front row rear-guard, and retire it. [AUTO](R): When this Unit attacks, retire it at the close step of that battle. [CONT]: This unit is also treated as a Gold Paladin. 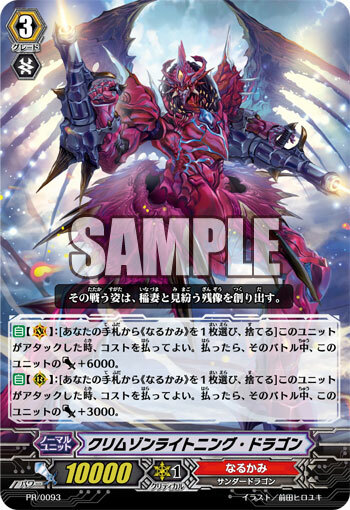 [AUTO]: [Counter Blast 1] When this unit is placed on Rear-guard Circle from your deck, you may pay the cost. If you do, choose an opponent’s grade 2 or less front row rear-guard, and retire it. 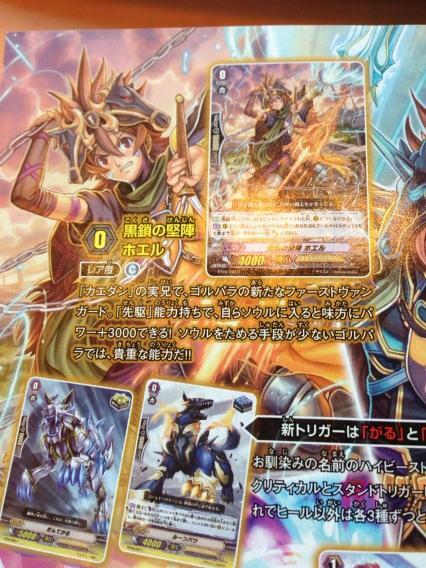 [AUTO](VC): Limit Break 4 (This ability is active if you have four or more damage):When this unit’s attack hits a vanguard, look at up to three cards from the top of your deck, search for up to one grade 3 «Gold Paladin» from among them, call it to an open (RC), and put the rest on the bottom of your deck in any order. 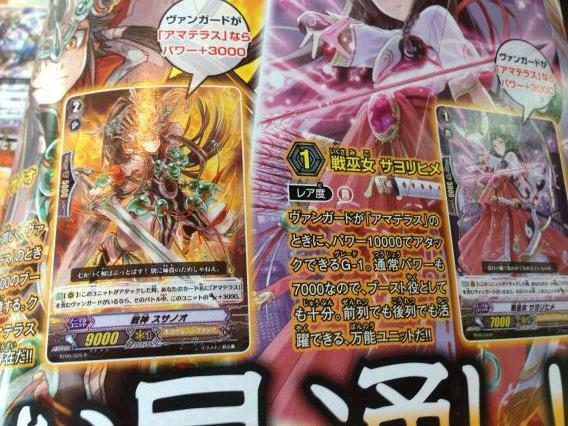 [CONT](VC):During your turn, if have a grade 3 «Gold Paladin» rear-guard, this unit gets [Power]+3000. A member of the Gold Paladins who wields a golden cane sword that emits particles of light. He is an oddball who doesn’t belong to one of the 7 groups, unlike other members. He is a knight who joined late in the « War of Liberation », showing up suddenly at the same time the King of Knights was going about, trying to get the Gold Paladins recognized as a standing army of the nation. All other information about him is quite unknown, and since he belongs to no group, he is effectively treated as the 8th head knight. Even after the glittering flash passes, vestiges of light hang around. The power of the light is so potent that even smell hangs in the air, despite the fact the wicked are unable to touch the afterglow. A flying dragon warrior whose entire body was blessed by the divine grace of the Thunder Dragons. There are few defensively based soldiers in « Narukami », so they borrow divine blessings and gifts as a means for nearly all their defensive needs. His roar, like that of a lion’s, is the signal of the protective magic being activate, and while short-lasting, it can deflect all attacks once set-up. He protects his allies as they quickly withdrawal from the current front-lines, though quick escape tactics, which is based on the way Winged Dragons fight, as they are the fastest fliers among the Dragon Tribes. As long as the shield of thunder is alive and well, those « Narukami » will never be wounded by any sword. Comme vous pouvez le constater, il y a une modification chez les Perfect Guards : ceux-ci seront désormais nommés Sentinel et sont restreints à 4 par Deck ; ils ont aussi un espace Shield doré. Le fait que chaque clan ait à ce jour qu’une Unit de type Sentinel confirme de manière officieuse que les Units à double-clan seront de la partie prochainement, à partir de la BT10 qui sortira en Février ! Affaire à suivre ! As you can see, there is a change for the Perfect Guard cards : starting from now, those ones will be called Sentinel and you will not be able to put more than 4 cards of their kind in a Deck ; moreover they have now a golden « Shield ». The fact that every clan has, today, only one Sentinel Unit confirms informally that we will see dual-clan Units soon, starting from the BT10 which will be released in February ! To be continued !